Sarasota is a wonderful city located in Southwest Florida on the Gulf of Mexico. Pristine white sand beaches line the coast and the cultural lifestyle of the tropics is appealing to those who reside or vacation in this beautiful city. For fast friendly assistance with your home search, call us at 941-235-7474 or email us at sales@suncoasteam.com. Sarasota is nestled south of Tampa and north of Fort Myers and includes many tremendous views of the Gulf of Mexico and Sarasota Bay. The world renowned beaches of Siesta Key and Lido Key are known for the soft white sands that greet beachgoers and leave them wanting more. A portion of Longboat Key, the largest of the keys, is also part of Sarasota County, though the county line that was adjusted in 1921, divides Longboat into both Sarasota and Manatee Counties. 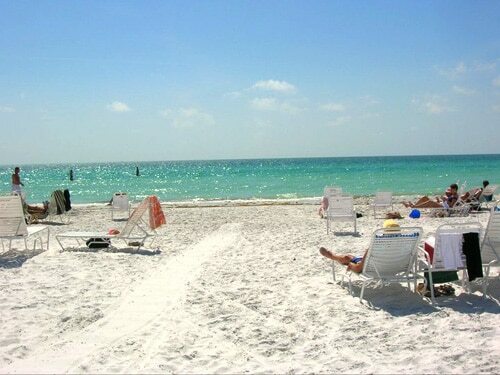 Sarasota is popular for its beautiful white sand beaches on the Gulf of Mexico. Sarasota is most popular for the irresistible white sand beaches that touch the clear, tropical waters of the Gulf of Mexico. Consistently ranking in the “Top 10” for beaches in the United States, the beaches in Sarasota will not disappoint. The 2011 winner of “#1 Beach,” according to the famous Dr. Beach rankings, Siesta Key Beach sits among the top of the best beaches in the United States. Beachgoers spend their day relaxing in the shade of a cabana, soaking up rays, splashing in the water, or strolling along the beach looking for shells. No matter what beach activity you fancy the most, you will be able to enjoy it on the beaches in Sarasota, Florida. Sarasota is also known for its cultural uniqueness. Home of the John and Mable Ringling Museum, a beautiful waterfront, the small town charm of downtown, the Farmer’s Market, the annual Blues and Music Festival, the tremendous conservation efforts of Mote Aquarium, Sarasota Jungle Gardens, and Marie Selby Botanical Gardens, the numerous nature related outdoor activities, and of course the magnificent beaches, Sarasota has something to offer to everyone. 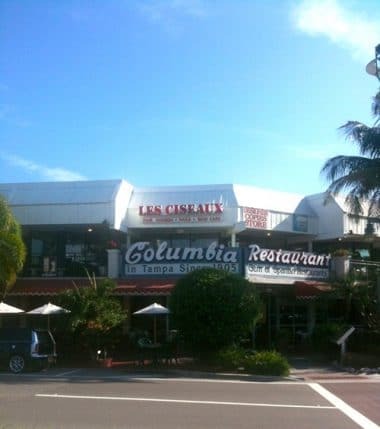 Sarasota offers a variety of dining and shopping, including upscale boutiques and restaurants on St. Armand’s Circle. One of the biggest perks to owning real estate in Sarasota, Florida is that the entertainment options are endless. For those who like casual, fine, or eclectic dining, Sarasota offers many local restaurants that will satisfy your taste buds and keep you coming back for more. If shopping is your idea of fun, there are many locally owned boutiques and clothing stores, as well as the popular retail stores all throughout Sarasota. Perhaps the best spot to find all of your dining and shopping is at St. Armand’s Circle. St. Armand’s is a short drive from downtown over the Ringling Bridge. St. Armand’s Circle offers a variety of clothing boutiques, swimwear shops, jewelry stores, artwork galleries, home furnishing stores, and much more. You will also find many delicious eateries and restaurants that range from classic American, to local cafés, to Columbian dishes, fresh seafood, to ice cream and frozen yogurt. There is something here to satisfy anyone’s craving. This great city is also an adventurer’s paradise. Whether you want to spend the day fishing from a dock or out in the middle of the Gulf, Jet Ski, boat, kayak, parasail, windsurf, paddle board, swim, hike, bike, roller blade, or photograph wildlife, you will find all that and more in Sarasota. Spend your day on or near the water while you are welcomed by dolphins jumping from the water or the giant, gentle manatees eating in the mangroves. If you are looking for the nightlife scene, you won’t have to venture far. Spend your nights at the fun, beach bars and restaurants in Siesta Key, walk around downtown and find the venue that suits your style, spend an evening in Gulf Gate or Southside at any of the numerous bars, wine shops, or restaurants. With so many places to go, you will always find something new and exciting in Sarasota, Florida. Sarasota is the perfect place to own a single family home to raise a family, make a permanent residence if it is just you and your significant other, use as a vacation home, or utilize as your snowbird getaway. Contact Your Suncoasteam and let use help you buy or sell your home in Sarasota, Florida. For fast friendly assistance with your home search, call us at 941-235-7474 or email us at sales@suncoasteam.com.